Slateford’s only defeat in 12 Water of Leith 1st Sixteen games was a 7-0 hammering at Balerno, but the front-runners for the title managed to avenge that with a 7-2 triumph in the return fixture. Wins on the rinks skipped by iconic figures Robert Marshall and Andy Ramsay also earned them a bonus point, but the clean sweep was denied by Steve Watson’s commanding win over Jamie Gracie. Marshall, right, only failed to count on four of the 17-ends as he skipped Bill Herd, Louis Beaton and Davy Ross into a 13-2 lead, then onto a massive 29-7 win over Maxi Baigrie. Watson kept Balerno on the map with a strong performance to skip S Marshall, J Watson and S Wightman to a 21-11 win over current E&L skip, Gracie. The other results from the 13th round of fixtures haven’t come to hand, but the league table after 12 games played reads: Slateford 65, Sighthill 56, Gorgie Mills 51, Balerno 40, Currie 40, Beechwood 31, Juniper Green 31, Bainfield 22. • Colinton stage the Forrest Fours competition tomorrow and it has special significance as the event commemorates their stalwart member Alastair Forrest who passed away recently. 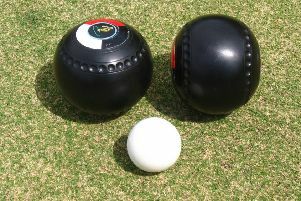 Alastair was a weel kent figure in wider bowling circles as a long serving treasurer of The Scottish Inter County Top Ten Association. • Sighthill host the final stages of the inaugural Under-25 Scottish Cup tomorrow and there is a local interest in both semi finals (11am) with Midlothian facing Dumbartonshire and East Lothian tackling Lanarkshire. The final is scheduled for 2.30pm and the event is sponsored by I.Q. Fire & Security.